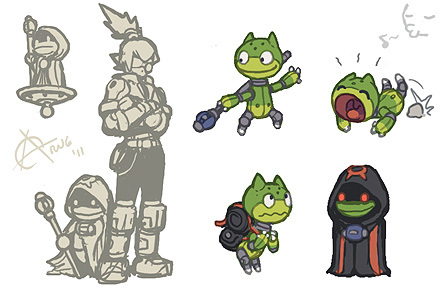 I did these drawings for the Megaman Legends 3 mascot contest. I think the art director liked the green "frog" the best. I think the problem with that concept, visually, is that it can't decide what it is. Cactus-frog-kitty? Details: Fairly recently, a construction company tried to clear out an old ruin to make room for the city's expansion. The project had to be abandoned because a strange energy field adversely affected on the on-site construction machinery. The company saw no profit in pursuing the project with just man power. Besides, the workers believed that the place was cursed. Most of the "possessed" machinery was simply left behind. 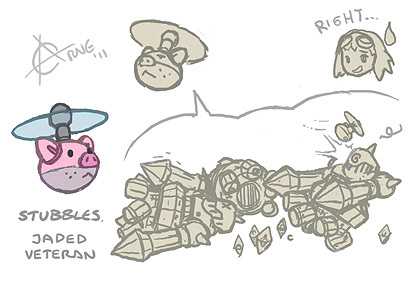 The Bright Bats find Metina as she's going through a pile of machinery junk, trying a helmet or arms on. How did she come to life? If something is possessing her, what are its goals? What's causing the mysterious energy field? Comment: The body shape and name was inspired by Marina Liteyears fom Mischief Makers. Details: Gunk is found by the Bright Bats in the center of a crater, as if it had fallen from the sky. The Bright Bats unwittingly reanimates (hydrates) it when they trigger a water trap later on. However, instead of attacking the Bright Bats, it helps them escape the trap. 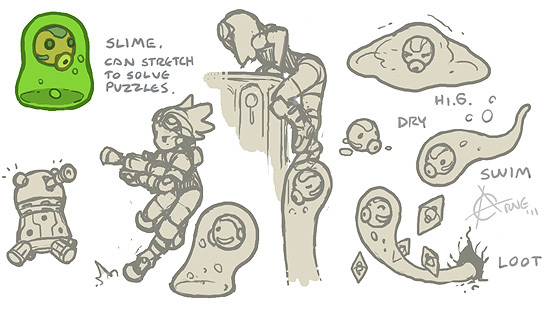 Comment: Puzzle solving mascot based on one of the MML2 bosses. Maybe it's an infiltration-type stealth unit, or just a messenger. Maybe a Rogue agent. Somehow it ended up wandering the ruins near the city. Perhaps RoperBot, being half Reaverbot, can be used to unlock some of the mystery surrounding the id of the Reaverbots and their motivations? Comment: Inspired by a Roper from Tower of Druaga. Details: Stubbles likes to exaggerate every inane thing he has experienced with using the language of an old jaded war veteran. He's the hero who had to fight his way through ruins on his own, taking down legions of Reaverbots (insert comical sequence of Stubbles head-butting Hanmuru's left and right). Comment: Inspired by the helicopter heads in Megaman 1. Details: Narrated by Darchron himself, trying to make a cool entrance: "As if ready to really face what's coming, the diggers (Bright Bats) stand their ground. A swirl of unnatural mist spews out through the massive, jaw-shaped portal. A deafening sound, unlike anything ever heard before, heralds the cloaked shadowed figure that emerges. Its pace is steady and calm, but the worn cloak quivers, as if agitated by a gale of time itself. Suddenly, silence falls and the figure comes to a halt. Worn eyes peer out from under the hood, resting on no one and one everyone. Seconds seem like minutes..."
Someone breaks the heavy mood. Comment: This character likes to narrate what's going on, using his "movie trailer voice"... often doing it when it's not appropriate, and greatly exaggerating what's actually happening. Because of this inability to be straight forward (about himself and his origins), he actually is a bit of a mystery. He makes up a different story everytime he's asked! While he may refer to himself as Darchron, or The Dark Wanderer, the Bright Bats are quick to make up a cute name for him. Details: When exploring a ruin, the Bright Bats come upon old cube. As they tinker with it, an entity suddenly springs forth (physical or holographic). It almost looks like a strange virus. It hums and clicks as it studies the Bright Bats. Then it changes into a cuter form and initiates conversation, presenting itself as a helpful PDA program perhaps. Regardless, it appears as if the Bright Bats and the cube entity have similar goals... but can the cube entity be trusted? Comments: Here I draw inspiration from Aladdin's lamp, the Hellraiser puzzle box, and PDAs, and maybe Pokémon balls. The entity assumes a cute appearance, but could occasionally malfunction and reveal bits of its true form or intention. The player will be left with a lingering feeling that something else, tremendous and frightening, is beneath the surface. When scanning the Bright Bats, perhaps it noticed some emblem or logotype and picked an appearance based on that in order to facilitate communication. The Cube can be carried around by the Bright Bats, with it's genie popping out of its prison (?) when needed. Sometimes it could run off on its own myserious errands, gathering data. 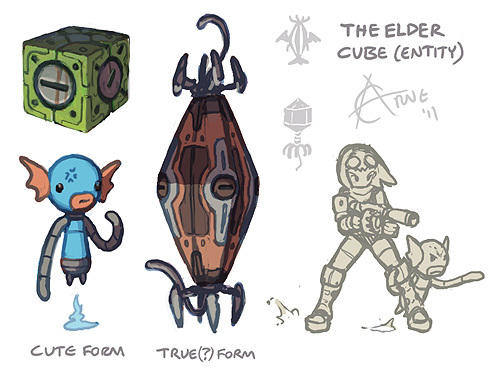 Edit: When the Elder Cube storyline comes to an end, and its terrible, omnious, epic plan is revealed, it could turn out to be something silly that only the cube entity is appreciative of. The entity could be on a quest "researching human anatomy", i.e. looking in idol magazines. When nearly caught, it hides the fact by quickly shifting its attention to random adjacent magazines... about nuclear fusion weapons, thus creating suspicion. Comical end! Comment: I never submitted this, iirc. I had some idea with the bow/ears, but perhaps I felt that the concept was too weak. Those flying bats in MM2 might be fun to base something off though. 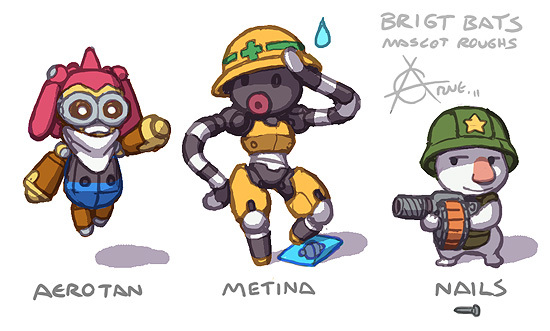 Also, an early sketch of Metina, and two unused concepts. Details: Somewhere, many years ago, there was a war, started by humans, but fought entirely by robots. It was a war of attrition that lasted long after the people who started it had died. The number of robotic soldiers dwindled with time as they continued this meaningless war. Eventually, only one remained. In its solitude, it started to reflect upon its own existence and gain some autonomy. It travelled far in search of purpose, and it thought it had finally found it when it eventually collapsed deep inside a ruin. Comment: This plot can explore the concept of self awareness and purpose. 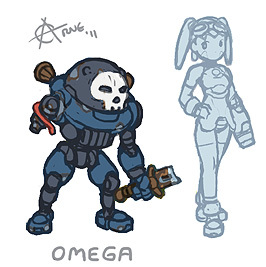 If the prototype game is concluded with the return of Megaman, then perhaps Omega can find the answer its looking for in Megaman or some other character. The broken sword carried by Omega is a reminder of its now obsolete function. The story is partly inspired by the Gold-Silver android conflict in ZOIDS (European version).